What Are Probiotics (and Prebiotics)? "Probiotics are the good guys—bacteria that help in everything from aiding digestion to synthesizing vitamins like vitamin K, which is essential for strong bones," says Mendell. "They also play a key role in your immune system by maintaining a protective layer around the GI tract, which prevents toxins from entering the bloodstream." Prebiotics are "basically the food for probiotics," Mendell explains. They help sustain the population of probiotics in your gut. "The best way to incorporate probiotics into your routine is through food itself," Mendell says. 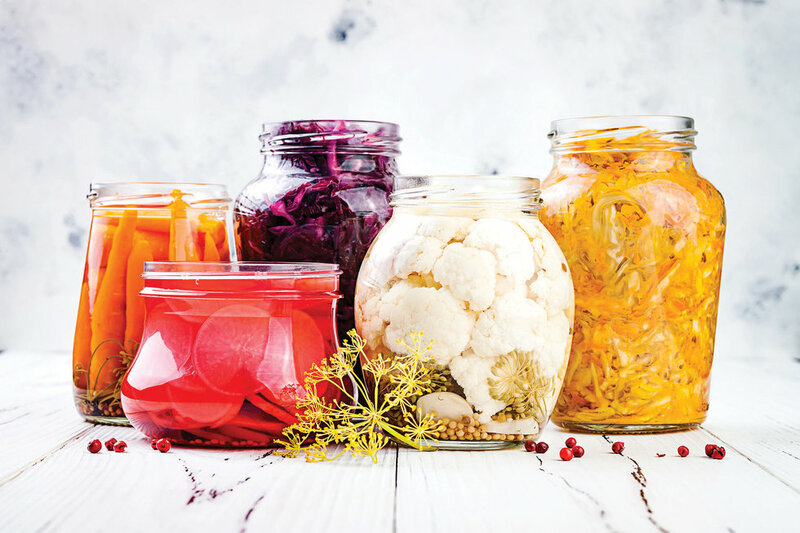 You can find probiotics in fermented foods like yogurt, kefir, sauerkraut, pickles, kimchi, tempeh, or kombucha. When it comes to prebiotics, reach for fiber-filled foods like oats, leeks, asparagus, garlic, onions, or bananas. Mendell stresses that "while all prebiotics contain fiber, not all fiber is prebiotic." Wondering how to include these foods in your diet? Mendell suggests the following: "Oatmeal with nuts and berries for breakfast; a salad with tempeh, steamed leeks, and gouda cheese for lunch; yogurt and a banana for a pre-rehearsal snack; and a turkey burger with pickles, sweet potato, and asparagus for a post-performance dinner." Supplements are sold over-the-counter, but Mendell advises getting probiotics through food when you can. "However, taking a probiotic supplement when you're on antibiotics for an illness is fine, though it's important to consult your doctor first," she says. That's because antibiotics not only help kill the unhealthy bacteria in your system, they also wipe out all the good bacteria in the process. Supplements help to replenish it. How Can They Help My Dancing? There's nothing worse than having to make it through a tough class while feeling bloated and uncomfortable. "If you're prone to gastrointestinal issues, increasing your intake of pre- and probiotic-rich foods can promote a healthy GI tract," Mendell says. Additionally, probiotics play a key role in your immune system, and can help stave off every dancer's winter nemesis: the common cold.